The Burmese Star Tortoise was nearing extinction. But now it is coming back from the brink, thanks to a small project just outside Mandalay in Myanmar. The Burmese Star Tortoise (also knowns as the Rose Petal and Spider Tortoise) is an endemic species of Myanmar. It has a black shell with dramatic cream-coloured star patterns covering each individual scute. It is critically endangered due, in part to local people eating them, and large numbers being captured and exported to China where it is considered a delicacy. Then to add to the population strain, it is also a victim of the cruel exotic pet trade. However, The Minzongtaung Wildlife Sanctuary, near Mandalay is helping to reverse the decline with a breeding and release programme. They started with just 12 tortoises from a group of 175 that were recovered, on the Chinese border, from a truck involved in the illegal trade. And now, just a few years later, they have already released over a thousand back into the 4km square wild sanctuary. The aim is to release around three to four thousand before creating new protected areas elsewhere in the country. 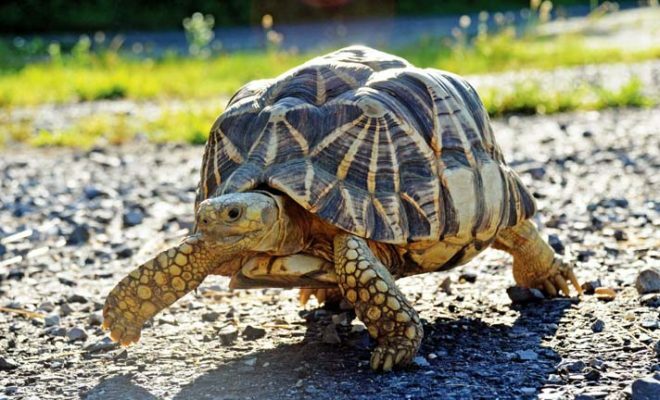 These tortoises can live 100 years so they need long term protection and for the first few years after release many of them are monitored with trackers and radio transmitters. This helps conservation staff understand their movements and track them should they escape the area or be stolen. Unfortunately, not all can be tagged due to the costs. However, every shell is tattooed with four Buddha symbols on one side (this tends to stop the locals eating them as the symbols make the tortoise sacred) and then a unique identifying number on the other side; this puts off thieves, reduces the value of the shell, and helps identify them, should they be trafficked. Each male tortoise is paired with two females, who produces around five clutches of eggs each season. A clutch can be between two and 15 eggs. They lay their eggs in the ground where they incubate for around eight to nine months. As the ground is very hard and dry, the female uses urine to soften the ground and then scrapes with her claws until she has a hole big enough for her clutch. Once the eggs are laid they are covered and left to their own devices. Within the sanctuary each ‘nest’ has a small wooden frame with wire netting put over it, plus a label indicating which female is the mother. The eggs are then protected until they hatch. The sanctuary usually has around 75% hatch success rate, but in 2016 El Nino swept across Myanmar dragging temperatures up to 47’C – and many of the eggs simply cooked in the heat killing the embryonic tortoises inside. That year the hatch rate was down to below 50%. At around three years old some of the tortoises are released into the wild area of the Sanctuary, where they will start to breed at around eight years old. A visit to the Sanctuary will allow you to meet the tortoises helping to bring their species back from the brink – you can get quite close and take great photos, but no touching! These animals are not pets. During the hottest part of the day they can be found huddled in the shade (unlike turtles who will bask in the midday sun). Seeing so many tiny year-old tortoises piled up on top of each other (their choice – not something the keepers have done) is a spectacle worth stopping to experience. And make sure you say hello to the Sanctuary’s spinster tortoise – a large, and quite fat (in tortoise terms) female, who has chosen the independent life and scares off any males who attempt to breed with her. Although very simple, this is a great project to visit and it is making a measurable difference to the Star Tortoise population. It’s early days yet – but they’ve made a good start. The project is part-funded by the Myanmar Government and two NGOs – TATA Wildlife Conservation and the Wildlife Conservation Society (WCS). By visiting the Sanctuary you can contribute to the project through a donation or by purchasing a T-shirt or carved tortoise in the simple visitor centre. Although the centre is one of the most basic I have seen – it is also incredibly informative and accessible – with everything in well translated English with images to support the information. I have seen many visitor centres, with far more money thrown at them, which don’t do anywhere near as good a job as this one – so do take time to pop in and read the vinyls hung between the bamboo poles. There is no entry fee to visit, but tour companies like Khiri Travel make a donation for every visitor they bring to the Sanctuary. This helps the Sanctuary tag more tortoises, which is an essential part of any conservation project. So, put this on your ‘must visit’ list when you’re in Myanmar.